There are various types of air purifiers available in the market today, ranging in size, quality and price. Basic Air Filtering Purifier: The most basic air purifiers employ the use of a cloth type filter to remove the dust particles. HEPA or High-Efficiency Particulate Arresting filters are the finest filters and can trap 99.97% of the particles in that air. Typically, a fan pulls air through a foam pre-filter designed to remove some larger particles. The air is then forced through the pleated HEPA filter, which is designed to trap most particles. The air might then pass through a carbon filter to remove odors. Sometimes the carbon filter will take the place of the pre-filter. Pros: Removes dust, pollen, mildew and pet dander from the air, relieving many allergy symptons. Cons: Although a HEPA purifier can trap most suspended particles, it is ineffective against chemical fumes, odors and gases, so a carbon filter is a must if you are concerned about these pollutants. Also, if the filter is not replaced every so often (according to the manufacturer’s instructions), the unit in ineffective. Ozone air purifiers: also called ozone generators, These devices release ozone (O3) molecules into the air, which reactively combines with chemical fumes, odors and bacteria. Room air passes through a high-voltage plate, where some oxygen molecules are ionized. These ions combine with oxygen to form ozone. The size of the generating plate and the amount of electrical current affects the amount of ozone produced. Pros: Removes the odors, gases and chemical fumes left behind by the basic air purifying unit. Cons: Cannot eliminate particles and other allergens. In general, ozone generators emit high levels of ozone, so they are not meant for routine air cleaning. They should be used only by professionals in unoccupied areas after serious contamination has occurred in the home, say from a fire or a flood. Carbon air purifiers use activated carbon as an air filter. The carbon bonds with the particles and odors when the air is forced through the filter. Pros: can catch smaller dust particles as compared to a HEPA filter. Cons: can remove odors, gases and chemical fumes as compared to an ozone air purifier. Ionic or Ionizing air purifiers: also known as electrostatic precipitator air purifiers, impart an electrical charge to the air, creating charged molecules known as ions, which are supposed to cling to airborne particles. These units have an oppositely charged collection plate or filter designed to attract the particles. Ozone is produced as a byproduct, which then exits the machine and flows into the room air. Pros: Handles both particles and odors/gases/fumes with less negative impact than an ozone generator type unit. Cons: Ozone is created as high voltage converts oxygen to ozone. All electrostatic precipitators can create ozone, though some emit more than others. Some people mistake ozone’s sweet smell for a sign of cleaner air. 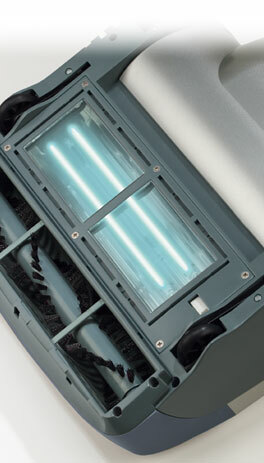 Ultraviolet light air purifiers use concentrated UV-C light (shortwave UV light) destroy pathogens (microbes) in the air. This would include air born illnesses like colds, flu, smallpox, anthrax, e coli, Legionnaire’s Disease, and staph as well as air born allergens like molds, mildews, and fungi. UV air purifiers are claimed to clean 98% of air born pathogens each time the air is recirculated. Pros: eliminates germs/illness from the air, promoting better health in home/office. Cons: does not eliminate dust, which is not technically considered a pathogen. Hydroxyl radical air purifiers use UV light to produce just enough ozone to enable the production of hydroxyl radicals, an extremely powerful air purifying agent that is reputed to have no harmful side effects. (As the ozone is produced, it Is exposed to the UV light, which breaks the each ozone molecule(O3) into an oxygen molecule (O2) and an “oxygen singlet” molecule (O1). The O1 molecules are highly reactive, and will combine with hydrogen atoms in the air to make OH (hydroxyl radicals). )The hydroxyl radicals are, in turn, magnetically attracted to pollutants until these newly-formed larger particles become too heavy to remain In the air you breathe. They then settle on surfaces and are cleaned up by normal cleaning activities like dusting and vacuuming. Pros: Can be combined with UV light technology to not only remove particles, but also to kill pathogens. Cons: Increases the amount of dirt on surfaces.The functioning parts of the unit must be kept clean, which requires replacement parts and labor. The frequency at which cleaning/replacement must be done is proportional to the amount of pollutants in the air. Some air purifiers combine two or more technologies to make the purification process most effective. Although these products are expensive, their efficiency is frequently worth the increased cost. Click here to check out all the air purifiers at Amazon.com ! Mechanical sweepers were the next improvement in floor cleaning after the broom and dust pan. Sweeping your floor the old-fashioned way would move dirt around the floor to corral it so it could be swept into the pan, doing a lovely job of stirring up dust as you did it! The carpet sweeper would capture and store the dust in a tray concealed inside its body, at least in theory. The Union Sweeper, patented in 1858, used wheels on one side of its body to turn a brush roller that would, supposedly grap dirt off the floor and propel it into the bin. Another type of mechanical cleaner was called the sweeping box. There were no wheels; the elongated sides of the dust collection box acted as sled runners so it could glide along the floor. It had a hand crank (and belt) to turn a small pulley connected to the brush at the bottom of the machine. There were several similar designs. The Hatlinger “Champion” (see the picture left) is an early sweeping box from 1873.
still around today ! It had two sets of wheels under the sweeper; these came into contact with the brush roller and turned it by friction as the sweeper was pushed back and forth across the floor. Sound familiar? It was light in weight and easy to use, but the sweeper worked best on hard surfaces; only surface litter could be collected from short pile carpeting; the set in dirt was not affected! The Bissell Co. (Now where have we heard that name before?) has promoted this type of sweeper since the late 1800’s and continues to sell it in today’s market. The Bissell Crystal Sweeperwas used by salespeople to demonstrate the cleaning action of the brush. The glass top gives a clear view of the black and white bristles. Their colors easily allow the viewer to see the dirt that is picked up. You can see the Bissell logo is actually etched into the beveled glass cover. 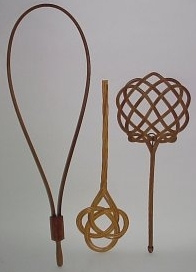 Mechanical carpet sweepers evolved further when the element of suction was introduced into their design. The Combination Sweeper or Vacuum Sweeper had an extra set of wheels added to the rear of the body to power two (or three) bellows, which, in turn, pulled air in through a nozzle that was mounted in front. The original wheels on either side of the unit still rotated the brush as the machine was propelled back and forth acoss the floor. It apparently worked best when it was pushed quicky back and forth, but there was never sufficient suction or power to do a thorough cleaning job. Another point against it was the increased weight and bulk introduced with the vacuum motor. Pictures and information are from http://www.vachunter.com/sweepers.htm. Beating a Rug – the old fashioned way! Beating a rug with a beater – yes, that’s what it was actually called! They came in all kinds of shapes. They came in steel, wood and even rattan! If you are interested in more vacuum cleaner history, take a look at http://www.vachunter.com/history.htm. Halo Vacuum – A germicidal vacuum! Developed by Ken and Carrie Garcia, a set of parents blessed with triplets, the Halo vacuum line uses specialized ultra-violet light as an additional tool to kill living organisms as you vacuum! UVC technology has been used for years in hospitals to disinfect and kill germs on surfaces, but never before has it been available to the consumer for the purpose of cleaning and disinfecting carpets & floors. There are 2 models of this vacuum available. They are both light weight – about 16 lbs – and easy to maneuver. The Halo UVX is the base model, coming with a beltless brush bar, a motorized height adjustment with 5 levels and a retractable handle for ease of storage and also to handle vacuuming mattresses. There are no belts to change, which is certainly a convenience. It has a 31 ft. long retractable cord in addition to both HEPA and carbon filters to reduce the amount of debris put back into the air. This model runs about $399 MSRP, but click here for a discount at Amazon.com. The Halo UV-ST has the same features as the base model, but includes a number of attachments as well as more of a sleek space-age look. (Check out the picture on the left.) The attachments include a crevice tool, a hose and an upholstery brush. (see picture at right). This little gem retails for $499 MSRP but click here to get a good deal through Amazon.com. There is reputed to be a new Halo vacuum model coming out sometime in 2008.